This is the MYO, a new motion controller mouse, but this one is special. 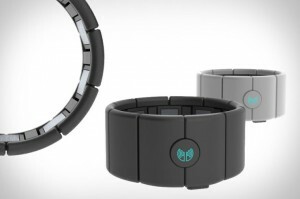 MYO has a sensor to detect the electrical impulses in the muscles of your forearm. This, alongside a motion detector, allows the armband to resolve your hand and arm movements with extreme precision, down to the individual fingers. It may even seem at times that your finger twitch is detected even before you’ve actually done so: this is because the muscles are activated slightly before your fingers actually start moving, and the MYO picks the signal up first. So what can you do with it? That’s still in development. There’s going to be an API, and it will work with PCs and Macs, but the specific kinds of things you can do is up in the air. We’re thinking mouse replacement, but of course it’s much more than that. 3D model manipulation, gaming… If done right, the possibilities are, as they always say, endless. The best part is the price: $149, to be released late this year. It has now been released, and you can get one here!! With a wave of your hand, MYO will transform how you interact with your digital world.